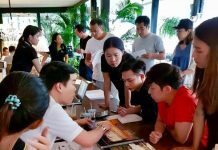 Aeras Condominium held a party for real estate agents and local media at their stunning sales office and showroom on Jomtien Beach Road on Friday, March 28. Aeras was launched in November 2013 and has already sold 45% of the total number of units, with construction due to start at the end of 2014. 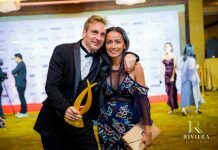 This is yet another project from The Urban Property, the company who also created Acqua, The Gallery, The Urban Pattaya and Sixty Six Condo, which won the ‘Best Boutique Condominium in Pattaya’ at the Thailand Property Awards in 2013. The Urban Property Managing Director Sompop Vanichsenee (center) poses with management colleagues and sales staff at the Aeras Condominium agents’ party held March 28. The party last month drew about 80 guests who enjoyed the buffet, free flowing drinks and entertainment, which was provided by a band playing popular songs. 4 lucky winners walked away with raffle prizes of wide-screen televisions and mini i-Pads and the Emcee also dished out vouchers for Starbucks after guests answered a quick quiz about Aeras. 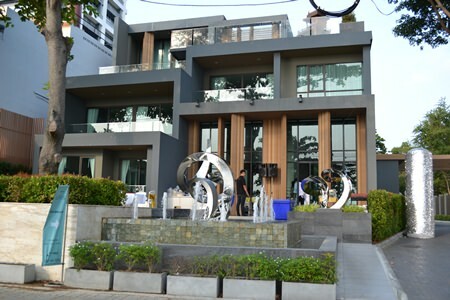 The Aeras Condominium showroom is now open on soi 17-18 Jomtien Beach Road. Aeras Condominium will consist of two main buildings in a beachfront location; one high-rise at 38 stories and containing 304 units and one low-rise 4-storey building with just 13 units. Room sizes range from 26.5sqm studios up to 182sqm penthouses. Facilities include a swimming pool, fitness center, library, games room and children’s play area. 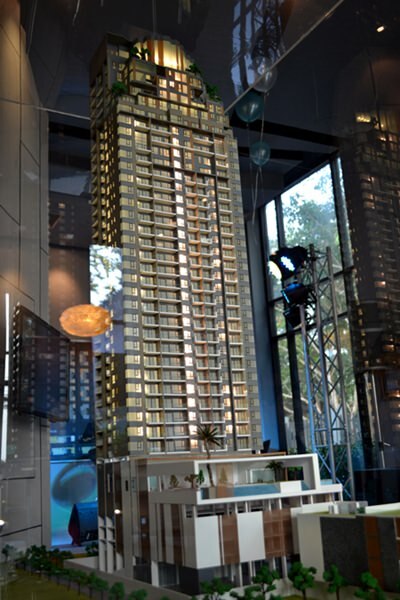 More information about Aeras Condominium can be found online at www.aerascondo.com. Aeras Condominium will consist of two main buildings with 317 units in total.